I don’t recall who uploaded a short video of Dr. Ishigaki’s presentation at last year’s TUSA Tenkara Summit. If you watched it he made brief mention of a new DVD that would be coming out in 2018, with the title 「数か、尺ものか テンカラ新戦術」.The DVD will be available later this month. It’s already listed on Amazon JP. A few (something) New Tenkara Tactics. The Something bit is 尺ものか, which I think means something like - a new standard of scale. Or Higher Scale to aspire too. The idea of a higher skill level, I think. Or maybe just new tactics developed by long scale of experience. However, the important part of the title is New Tenkara Tactics. 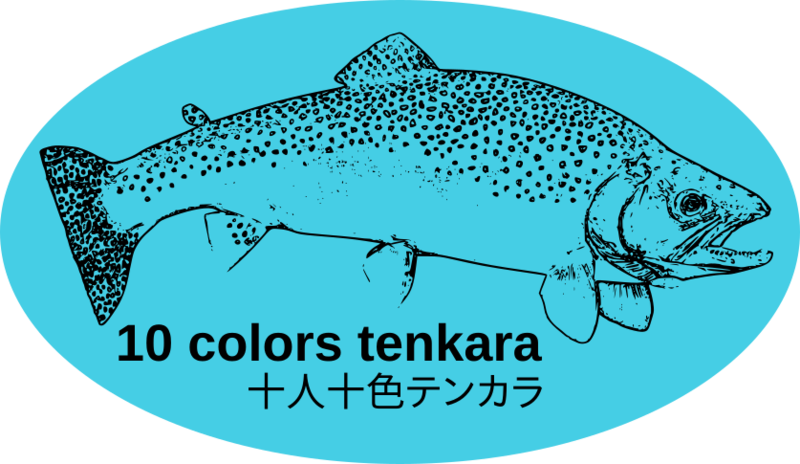 And the theme is テンカラは十 色, Tenkara is 10 Colors, Which should be a crowd pleaser on a forum of similar name. The featured tenkara anglers in the video are Takahashi Shin-san (高橋伸さん) & Saigō Kazumi-san (西郷和巳さん) , aka Ajari. ７０分 , 70 minutes. From Tsuribito. I also found a new YTC, (YouTube Channel) labeled Tenkara King (テンカラ大王). Which is Dr. Ishigaki’s nickname. Right now there is only one video on the YTC, an introduction to the DVD, but maybe more will be added later. As you can see some scenes are filmed with a drone camera, other with head worn cameras. Dr. Ishigaki is a really nice guy. I enjoyed meeting him at the Tenkara USA Summit. I really wish people would do digital distribution. I haven’t owned a DVD player for years. But, that also means you could get one really cheaply now! FLA makes a good point. That would be easier in many cases. Last time I shopped for a laptop, 2.5 years ago for my son going away to school, many of them no longer include a DVD drive. Technology moves ahead faster than marketing practice. I read Nicholas Nigroponte’s book, Being Digital, just after it was published in 1995. His theme was “ship bits not atoms”. It never became reality. His idea was for example; you don’t buy a newspaper you only buy the columns you want to read. Or for tv providerss you only buy the shows you want to watch, and not pay for stations you would never watch. Seems the marketers don’t want to pay that game, they’d rather force you to buy stuff you don’t want, to grab more of your money, and pass it on to show providers, such as sports leagues. 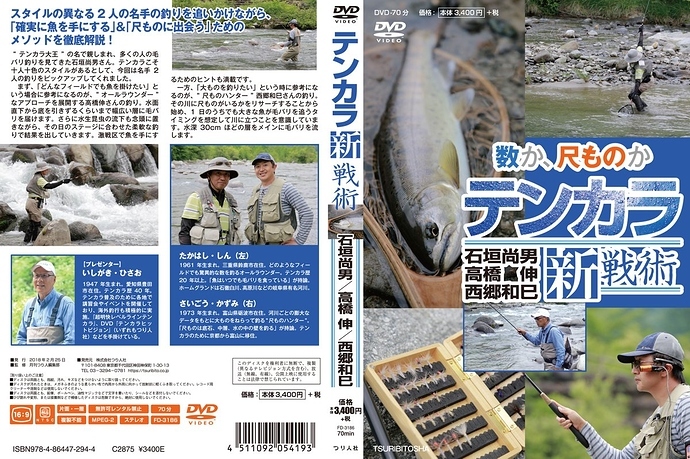 The Discover Tenkara guys did offer digital downloads of their DVDs after the initial release only on DVD. (many of them sadly later this month will no longer be available over what seems to be some copyright dispute with someone who helped make their earlier DVDs.) And keeping videos only on DVD probably also makes it a little more difficult to give away copies to people who did not pay for them. My MacBook has one port, nothing else except a plug in for earphones. And I like it like that. According to Amazon Japan, this will be available for sale next Thursday. Opps, guess I neglected to point out the release date in my original post. I will probably order it next week via Tenkaraya, and add on a short sleeve Sebata tee-shirt. A friend told me he just ordered one. I thought it a good idea too. I have a long sleeve one ordered from TUSA when they had them, but a short sleeve one would be nice to have for summer, and I’ve dropped 40 lbs over the last year. I can now drop back down one size again. You’ll have to let us know how the video is, if you get it. It’s an unashamed brag, but I am really proud that me and JP introduced Ajari and Takahashi san to the English-speaking audience through Go Ishii and Dr. Ishigaki’s introduction to them in 2014. They are both phenomenal “next level” anglers and have influenced Dr. Ishigaki’s thinking immensely over the last 5 years or so. While I appreciate your sentiment @Paul_Gaskell, I do believe there’s a difference between bragging and being proud of something that you’ve been a part of. I think this is certainly a case of the latter. Without JP and you, people like me who have never been to Japan, would never know about them. Your videos with them are great.